This level has hard difficulty. 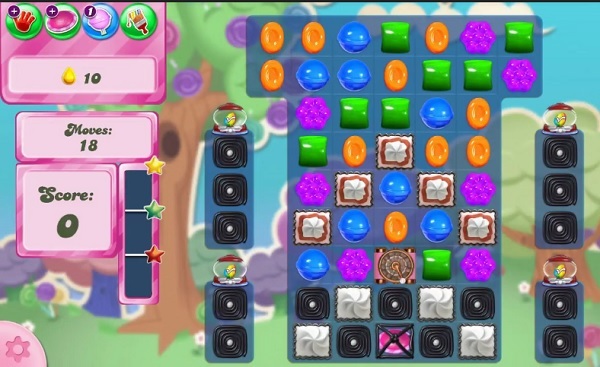 For this level try to play from middle part of the board and make striped candy. Use striped candy with other special candy to break the corner blockers and to break the yellow candies. It is totally impossible. No different on my computer, phone, or tablet. All have 15 to get in 16 moves! I also have to clear 15 yellow wtih only 16 moves as opposed to the walkthrough that has 10 yellow and 18 moves. Can you fix the problem ? I would appreciate the HELP. Let me correct the previous post 15 yellows in 15 moves! Hi.could you please check level 2760. This level is giving me 16 moves to get 15 yellow candies. The video is asking for 10 yellow candies within 18 moves. Very difficult to complete. Please check and fix. Thank you. This looks like another case of the Facebook/computer app being different than the phone apps. I also have to get 15 candies in 16 moves & am finding it impossible. I’m going to go to my tablet later and see of it has the 10 candies in 18 moves board. Same crap, different day. This level is impossible. 15 yellow in 16 moves? Really? It can take 7 moves just to break open the first yellow. Insane. I have only 16 moves to get 15 yellow. On this video you have 18 moves to get 10 yellow. Why the difference? Have only 16 moves. Thanks for listening & your help. Second try. Wasn’t bad at all. I’m having the same problems! Frustrated! Impossible! This level seems impossible and if we’ve gotten to this level we certainly know what we’re doing. So what’s the solution, play over and over for days or weeks in hopes of getting that lucky board or quit and find something new? I’m just so frustrated.